The Khaled bin Sultan Living Oceans Foundation has completed the World Reef Map, an online interactive coral reef atlas that allows users to explore all of the coral reefs and shallow water marine habitats mapped on the Global Reef Expedition. This digital coral reef atlas is the result of years of work by a team of dedicated scientists and many months of field research in coral reef ecosystems around the world. Benthic habitat maps are an essential tool in coral reef conservation as they provide a snapshot of where reefs are located and the status of their health. Scientists use these habitat maps as baseline data to help track changes in reef composition and structure over time. The Living Oceans Foundation has made these coral reef habitat maps available to the public in this online platform so that governments and conservation organizations can use them in their own efforts to help protect and conserve coral reefs. On the World Reef Map, users will find high-resolution maps of coral reefs and other shallow-water marine ecosystems from 11 countries we visited on the Global Reef Expedition, including Fiji, French Polynesia, The Bahamas, Galapagos Islands, and the Saudi Arabian Red Sea. These extremely detailed maps show the type of habitat on the seafloor down to 1-meter resolution. Different habitat types appear as different colors on the map, so users can identify seagrass beds, sand, rubble, mangrove forests, and different parts of the coral reef. With over 65,000 square kilometers of shallow water marine ecosystems mapped, this is by far the largest collection of high-resolution coral reef maps ever made. To create the maps, scientists combined satellite imagery with ground-truthed data to verify the accuracy of the maps. Divers surveyed the seafloor, while scientists dropped cameras from boats into the water to see what the habitat was like at various points around an island. Many of these geo-referenced videos appear on the World Reef Map so you can see what the seafloor ecosystem looked like in real life at the time they were surveyed. The World Reef Map also includes tools you can use to calculate the habitat distribution around an island, measure the length of a coral reef or the area of a seagrass bed, and identify and learn more about habitat types just by clicking on the map. The World Reef Map also includes very fine bathymetry data so users can know just how deep the ocean is at any given point. 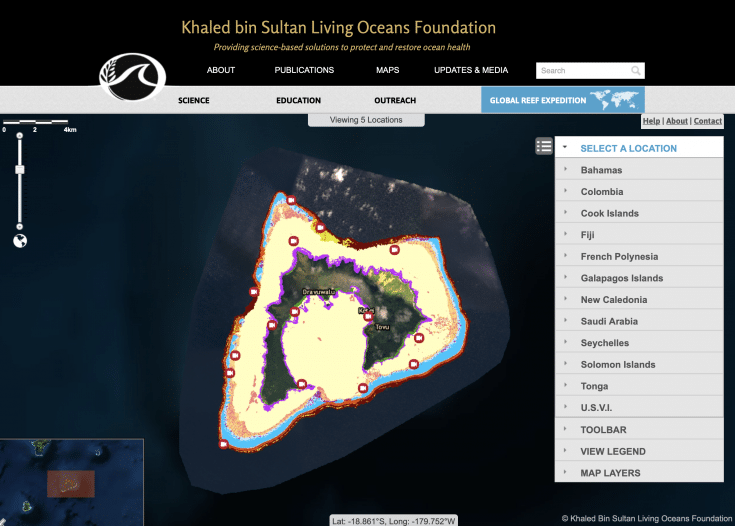 The Khaled bin Sultan Living Oceans Foundation is using these maps in our Global Reef Expedition scientific reports, which provide an assessment of the health of coral reefs in a region and aim to help local stakeholders and government officials better understand and manage their shallow water marine resources. These maps are also being used by our partners at the University of Miami to develop a global coral reef resilience model that will allow us to monitor changes in the health and spatial extent of coral reefs worldwide. If you would like access to any of the GIS data underlying our World Reef map in order to help protect, conserve, or restore coral reefs, contact Alexandra Dempsey, Director of Science Management, at dempsey@lof.org to submit your data request.